pvc cards – Available in 480 micron and 320 micron. Suitable for use with all brands of direct-to-card plastic card printers (not retransfer printers). Can be printed in monochrome or full colour and attached to proximity cards, or other cards, to provide personalisation. Available in packs of 100 or boxes of 500. PVC cards which can be split to form two / three key tags with a hole punched at one end for the fixing of a key ring. The cards are first printed using a direct to card plastic card printer and then split to form two identical long key fobs. Suitable for use with both monochrome and full colour ribbons – can be printed front and back if required. Supplied in packs of 100 cards (generating 200 key fobs) or 500 cards (generating 1,000 key fobs). Composite Cards 760 micron (30 mil) PVC cards containing 40% P.E.T. (polyester) core. 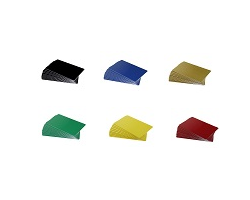 They can be used with stand alone laminating stations or with card printers with laminating stations. They are stronger than 100% PVC cards – the polyester core increases durability from 2500 to 25000 flex cycles. 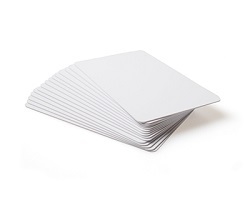 The extra durability and flexibility makes these cards particularly suitable for high-usage environments such as time and attendance or access control. Available as packs of 100 or boxes of 500. 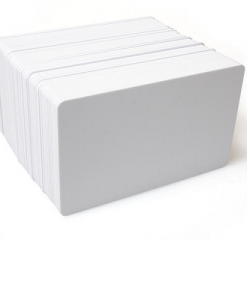 Select white PVC cards in various microns suitable for use with all brands of direct-to-card printers – both single- and dual-sided. (They are not suitable for use with retransfer printers). They can be printed in monochrome or full colour. Create Membership, Employee, Business or any other ID cards. Available in packs of 100 or boxes of 500.